EURO has created the following prizes to acknowledge an outstanding activity in the development or application of OR. The EURO Gold Medal (EGM) is the highest distinction within OR in Europe. The award is conferred on a prominent person or team or institution, for an outstanding contribution to the OR science. The award is officially bestowed in the opening session of a EURO-k Conference, if there is a suitable candidate. The EURO Distinguished Service Medal Award (EDSM) is conferred for recognition of distinguished service to EURO and to the profession of OR. The decision of the jury is publicly announced at the next EURO-k Conference. The award is officially bestowed in the opening session of a EURO-k Conference, if there is a suitable candidate. The Excellence in Practice Award (EEPA) acknowledges outstanding accomplishments in the practice of OR. All interested authors are invited to submit a description of an application of OR with a real impact on practice. A short-list of finalists are invited to present their work in a special session of the EURO-k Conference. The winner is announced during the closing session of the EURO-k Conference. The EURO Doctoral Dissertation Award (EDDA) recognizes the OR contributions of doctoral theses of scientists having less than two years research experience since completing a PhD. Three finalists are invited to present their work during the EURO-k Conference. The winner is announced during the closing session of the EURO-k Conference. 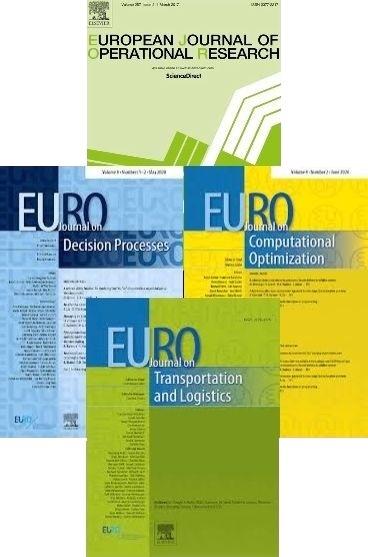 The EURO Award for the Best EJOR Papers. The best survey paper, best application paper, and best theory/methodology paper published in EJOR in the previous year are selected by a jury. An award of €1,000 is presented to the winner for each category at the closing ceremony of the EURO-k or IFORS Conference. Between Between 2001 and 2010 EURO offered the Management Science Strategic Innovation Prize (MSSIP) to foster specific areas of application of Operational Research in management. The prize was intended to reward outstanding contributions in theory or in practice of the envisaged area. This work is licensed under a Creative Commons Attribution-ShareAlike 3.0 International License and the GNU Free Documentation License (unversioned, with no invariant sections, front-cover texts, or back-cover texts). I forgot my username and/or my password.